I’d like to implement virtual worlds in Weber School District. Hopefully, I’m in a position to actually steer things in this direction, and make it happen and get beneficial results. My concern with the implementation is that Second Life itself has a minimum age of 16. Great for high school kids, but it leaves out anyone younger. Plus there’s safety and security policies in place that make it complicated. However, if we used OpenSim or another third party, self-hosted virtual world solution, we could have complete control over the server, albeit at a loss of the rich content in Second Life. In essence, we’re starting from scratch. This is why we must adopt a constructionist approach when addressing virtual world instruction. Constructionism is a form of constructivism where artifact creation is the product of learning. The way I see it, students themselves should be the primary creators of the content and build the sims, under the direction of the teacher. Lessons should be designed that teach the intended content while the student is in the process of constructing, and the lessons should be designed to support a situated learning framework. Identifying an appropriate context for the learning, and focusing on collaborative activities is important. When implementing constructionist activities in Second Life or OpenSim, it’s crucial that the teacher facilitates and provides consistent scaffolding support to the students, especially when there are varying skill levels. This takes constant observance of the activities, and at no time should a teacher stand on the sidelines, but be actively engaged in the process. With this type of activity, it is important that the instructor be continually and intimately aware of everything going on, to facilitate the experience. During the activity, the teacher should consistently provide help or suggestions that ensure a smooth and effective learning experience. 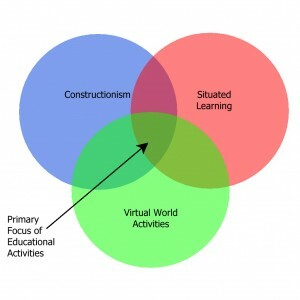 Identifying the types of activities that support the constructionist mode of learning inside the virtual world will enable us to find the right balance that fosters optimal learning opportunities. I certainly realize that there are many other ways to learn in a virtual world besides building content. But this is a necessary model for Weber School District, due to our existing infrastructure. The learning activities that should be implemented, necessarily should adopt this “situated constructionist” approach. This way, especially with the forthcoming mesh abilities of Second Life and OpenSim, drafting students could import their buildings into Second Life. 3d animation students could import their characters and models. Programming students could learn the Linden Scripting Language and code the simulations. The virtual world implementation will be autonomous, and draw upon effective learning theories to guide its educational development.